Colleges and universities continuously seek the best and brightest students – but too often, students with lower income backgrounds are overlooked. ATI has united schools with the joint mission to enroll 50,000 additional talented, low- and moderate-income students at institutions of higher education with strong graduation rates – by 2025. ATI released a two-year progress report in December 2018. To date, 110 colleges and universities with graduation rates at or above 70% over six years—including state flagship universities, small liberal arts college, and the entire Ivy League—have joined ATI. According to the report, ATI member schools added 7,291 additional lower-income students. In terms of undergrad enrollment, that’s the equivalent of a whole new Stanford or Georgetown. In the United States, research shows less than 50 percent of high-achieving, lower-income students apply to a selective college or university despite the fact that they are talented and have great qualifications. And – only six percent of the students at top colleges and universities are from lower-income backgrounds. Colleges and universities are seeing this problem and doing something about it. 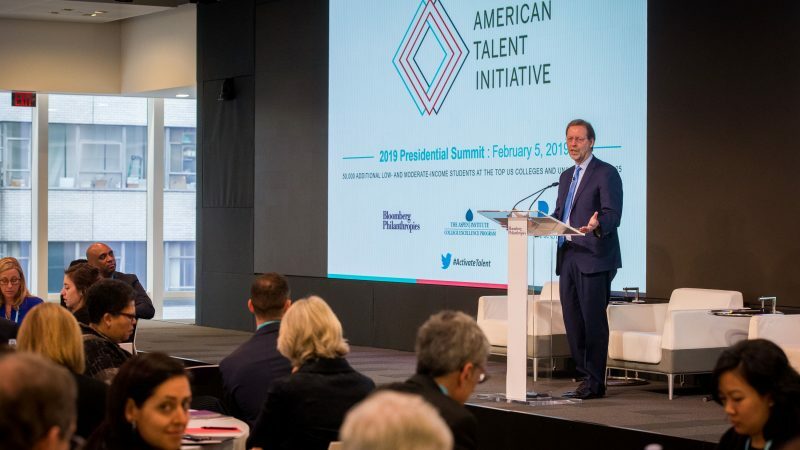 College presidents are joining together in the American Talent Initiative or ATI, a program to increase the number of low- and moderate-income students enrolled at schools with the highest graduation rates. Their goal? To accept, enroll and graduate an additional 50,000 of these students by 2025. We’re re-running an episode featuring a conversation between Dan Porterfield, President and CEO of the Aspen Institute – who is also a member of the ATI’s Steering Committee – and Howard Wolfson, the head of the education program here at Bloomberg Philanthropies. At the time this podcast was recorded, Dan Porterfield was the President of Franklin and Marshall College. They discuss the creation of ATI, how to hold schools accountable, and how to expand equitable practices beyond higher education. Schools across the country from East coast Ivies to West coast universities to schools in Texas, Florida, and Tennessee have all pledged to be a part of the American Talent Initiative, created by Bloomberg Philanthropies in partnership with the Aspen Institute and Ithaka S and R. The program is a companion effort to our CollegePoint initiative – a program providing talented lower-income students with virtual college advisors to help them get the support they need to get into the college of their dreams. In its first two years, ATI has established substantial momentum – and with continued commitment from schools is on track to meet its 2025 goal. To date, 110 colleges and universities with graduation rates at or above 70 percent over six years—including state flagship universities, small liberal arts college, and the entire Ivy League—have joined ATI. According to a report released in December 2018, ATI member schools added 7,291 additional lower-income students. In terms of undergrad enrollment, that’s the equivalent of a whole new Stanford or Georgetown. To learn more about ATI, listen now. With the convening power of Bloomberg Philanthropies We approached a few presidents; Carol Quillen at Davidson, Michael Drake at Ohio State, Brit Kirwan who was then at Maryland, Ron Daniels at Hopkins, and we put together an early coalition of really interested schools. Then I think it was the power of the examples of those schools that led a next wave of institutions like Princeton, and Harvard, and Stanford, and Yale to jump in and say, “Yeah, we’ll be in that.” From there it’s just been great momentum – a snowball gaining size. PORTERFIELD: I think that higher education definitely bears responsibility first, for not drawing a clear enough line between what happens in college and ones professional and personal empowerment later in life. We have to do more work to – A. build programs that help empower people to work and to create economic security in their families. And secondly we have to communicate better about what we’re doing that’s already working. Also I would say that one of the narratives about higher education is that it’s a privilege space where people talk to each other in kind of an echo chamber with a liberal bias, and while I don’t think that’s true, not uniformly true. I do think that colleges must emphasize powerfully, both on campus and off, the importance of the First Amendment and a Freedom of Expression, Freedom of Speech. Any failure we have to counter practices of people trying to silence unpopular views, or to assert that someone else doesn’t have a right to speak, need to be quickly and strongly condemned by higher education leaders. Now we have to teach students to listen and to slow down and not to condemn, but to open up their minds and to be open to perspectives different than their own. We can’t just dictate to student, but if we don’t engage this question of Freedom of Expression, shame on us because the power and value of higher education is that it allows all views to be heard and all ideas to be pursued, and so we have to stand for what we supposedly are. PORTERFIELD: Absolutely, and by the way we’re just getting started. The great organs of civil society in this country; colleges and universities, great foundations, great nonprofits like the Aspen Institute, together fill a role that that government can’t play, that the private sector doesn’t play. It is about advocating for the families and communities of our country, and making sure that unmet needs are framed, posed, and solved using data as often as we can to help us know we’re getting there. You can go to the website, which will give you information about what we’re doing and our 50,000 student goal. And importantly, give you the list of 96 colleges and universities, north, south, east and west, big and small, public and private. Everything from Carlton in Minnesota to Rice in Texas, to the UC system in California, and find out if your school is on there. If it’s not on there, you could contact the Admission Dean or the Head of Advancement or the President herself and say, “We really think that you should join. We’re going to find solutions. Thank you, Howard. OLIVER: We hope you enjoyed this episode of Follow the Data. If you are interested in seeing if your school is part of the American Talent Initiative or how your school can join, visit americantalentinitiative.org. You can follow Dan on Twitter at @DanPorterfield and Howard Wolfson at @HowieWolf. If you haven’t already, be sure to subscribe to our show and leave us a review or email us at followthedata@bloomberg.org to let us know what you’d like to hear from us. This episode was produced by Electra Colevas and Jenny Kane with music by Mark Piro – special thanks to Eric Sheppard.